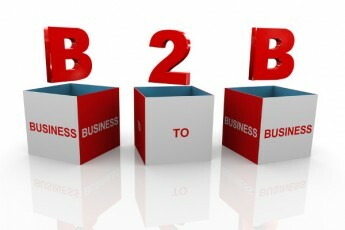 What makes B2B content effective? Understanding ways to match content with the sales process is just as critical as ensuring content quality. Gaining this understanding requires content marketers to master three concepts that mirror the way an enterprise sales process typically works: Organizations will struggle to get the most out of leads unless they possess compelling thought-leadership content, easily digestible teaser content, and the ability to consume prospect feedback. Let’s assume your content is well written and does a good job of explaining how your offerings solve problems and provide tangible business benefits. 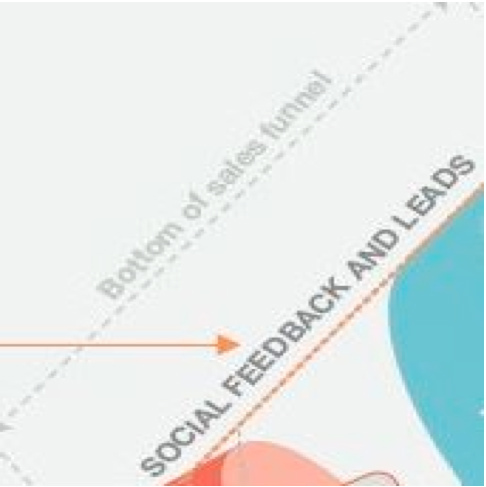 Now imagine a picture of a traditional sales funnel: wide at the top (where you find the new leads), narrower in the middle (where consideration occurs), and narrowest at the bottom (where deals begin to close). Each of these phases should trigger the delivery of corresponding B2B content and the deployment of certain actions to support that content. It may be helpful to think of the sales funnel as being shaped like a megaphone: Imagine the bottom of the funnel as a mouthpiece where thought leadership content is spoken — and then grows and changes in tone and volume as it resonates outward to increasingly larger audiences. For example, tweets, teasers, and abstracts could represent the shorter-form content needed for the top end of the megaphone — B2B content that is created to hook increasingly distracted audiences and draw them into your content stream. Multiple tweets on a topic might lead to a full paragraph of discussion; paragraphs could lead to having enough fodder for a full blog post, and blog posts can lead to a longer series of articles that then feeds the creation of a thought leadership-driven white paper. To see how the ideal process would work, let’s examine the importance of three key concepts that are essential to B2B content success: thought leadership, teaser content, and analyzing content-triggered audience feedback. B2B content must correspond to the classic sales funnel (click for larger view). Residing at the end of the sales funnel is thought leadership. Idea-rich and highly authoritative, your company’s unique voice rewards audience engagement and inspires return visits. Found in your densest content, such as white papers and bylined articles, thought leadership is truly useful and hard to fake. To produce it, you must enlist the content creation efforts of genuine subject-matter experts who are in tune with the challenges that real customers face — and equipped with thoughtful opinions about how to address those challenges. That kind of expertise is rarer than it should be, but prospects and customers appreciate it when they find it. The caveat: B2B decision makers are demanding audiences. Thought leadership content aimed at these audiences cannot read, look, or smell anything like a sales pitch or marketing presentation. Repurpose fluff or the latest PR talking points, and your words will get tossed or ignored outright. 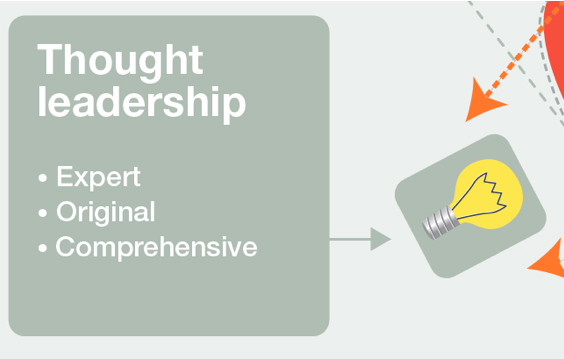 Thought leadership requires three critical components. Expert: Your ideas must be genuine and deliver real value — not irrelevant or phony advice, and definitely not arrogance masquerading as expertise. Imagine you have the critical, cynical eye of a professional journalist, and use those same sensibilities to evaluate the value of each idea you come up with. Original: Your ideas must be uniquely yours and reflect the timely perspective your brand has on the industry, marketplace, or other topic at hand. Comprehensive: Thought leadership has to cover all the bases, frankly and honestly. You know those questions your sales team is hoping won’t get asked? Your prospects will inevitably ask them, so don’t just ignore their concerns. Tackle them head-on. Finally, if you have more than five ideas in a given thought-leadership piece, you’ve probably got more than one piece on your hands. Think about how you can break up these ideas into more digestible pieces of information appropriately for your audience. 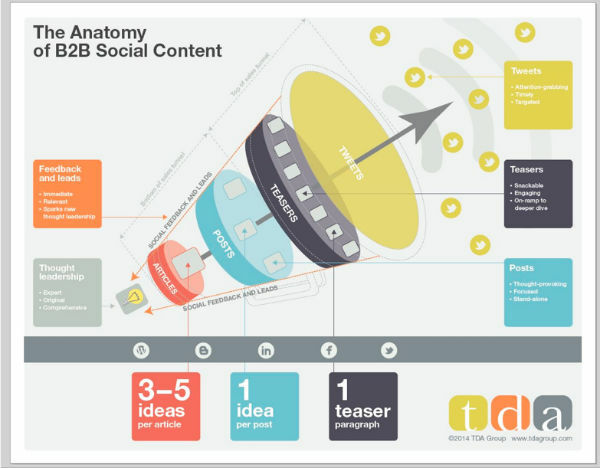 At the opening of the funnel, we find prospects that need social content before migrating to the big ideas in your thought-leadership content. As your audience moves through the megaphone/funnel toward these big ideas, you need to draw them in gently. Consider content marketing as akin to seduction: Few will be attracted, at the onset, to every last detail you provide in your content. Rather, attraction starts with capturing attention and then holding it before you move on to enticing the audience members through their curiosity and, finally, guiding their interest in the direction you desire. For example, the tweets and teasers that correspond with the outer ring of the sales funnel hook an increasingly distracted audience into your content stream. These short, concise bursts of content both pique interest and refine the audience — weeding out those who don’t fit your buyer personas and ensuring that the leads who progress toward your thought-leadership content are ready, willing, and even eager to consume it. Once hooked, the next step is to engage them with increasingly meaningful thoughts and ideas, represented in our infographic by the term “posts.” A post typically focuses on a single topic and covers it in a single chunk. If best practices suggest that an article or white paper consists of three to five main ideas, each of those ideas could be described, stand-alone, in a single post. Packaging teaser content for delivery: So what is the best way to package teaser content for optimum delivery and impact? It’s really a matter of individual judgment based on two criteria: audience preference and subject matter relevance. The marketer’s job is to determine the best fit for each specific idea based on what you know about the point you’re trying to make — as well as what you know about your audience’s attitudes, behaviors, and existing preferences — and then test the possible options to see what works best. Recognize that form follows function: For example, an abstract of a technical white paper might be best delivered as a short blog post, while high concepts in the same paper may be easier for a novice to grasp through infographics. Diversify, but optimize: The more delivery methods you have in play, the more prospects you will likely lure into your funnel. Once you have some feedback and are able to gain a better feel for what works and what doesn’t, you can then prioritize the content you create, as well as decide on the best delivery channels. One last piece of advice: Tweets and teasers are the newspaper headlines of the 21st century. Give yourself a gut check before posting any content: Ask yourself if you, as a consumer, would take the time to click through the teaser content you’ve created for any given post. B2B content matching the sales funnel should be the catalyst for a feedback loop. Once you begin engaging your audience with deeper thoughts and ideas, you’ll inevitably get feedback — along with potential new leads. As your reach extends, expect plenty of questions and opinions — both supportive and not. But even if some of the response you receive is not favorable, remember that nearly all feedback has value, and can serve as a testament to the success of your messaging — or guide you toward necessary improvements. Digest the feedback: The level and intensity of your feedback serve as measuring sticks with which to gauge the effectiveness of your brand-building and relationship-building abilities — two important objectives of your content marketing efforts. But how can you get the most out of this feedback? Listen to your audience reactions: Engaging your audience, immersing them in your thought-leadership content, and listening to their feedback will help improve the quality of future content and enhance your messaging over the long term. More comments and discussion mean further opt-ins into your sales funnel and broader interest in your message: By offering true thought-leadership content at the base of your megaphone that passes the decision-maker “giggle” test, you can boost the odds that your audience will walk away with a favorable impression of your company and your offerings, and even shape purchase requirements based on your best thinking. Remember that feedback can be a two-way conversation: Comments from prospects and customers offer valuable insight into positioning your brand or delivering your product or service, and can inspire new thought-leadership topics and content. Ultimately, responding to these interests will likely draw more prospects into your social funnel. Be sure to embrace the feedback (positive or negative) and modify your approach as appropriate. A closing thought: It all comes full circle. While long-term social success is marked by increased sales, a positive reputation, and satisfied customers, effective B2B social content starts and ends with thought leadership. Each phase of our megaphone can help you find and deliver an audience receptive to your unique voice. The resulting social engagement can refine that voice, strengthen your future content, and expand your audience base. For more great ideas, insights, and examples for advancing your B2B content marketing to greater levels of success, read Epic Content Marketing, by Joe Pulizzi. Paul Gustafson is president of TDA Group, Silicon Valley's premier B2B content marketing agency. The award-winning marketing communications firm provides a broad range of services to engage buyers wherever they are: on the Web, on smartphones, on tablets, and through print. Get more insights from Paul on Twitter @PSGustafson.